The A2Z of Motoring website was previously an out-of-date static XHTML site that couldn’t easily be updated without high costs involved. The website also lacked identity. 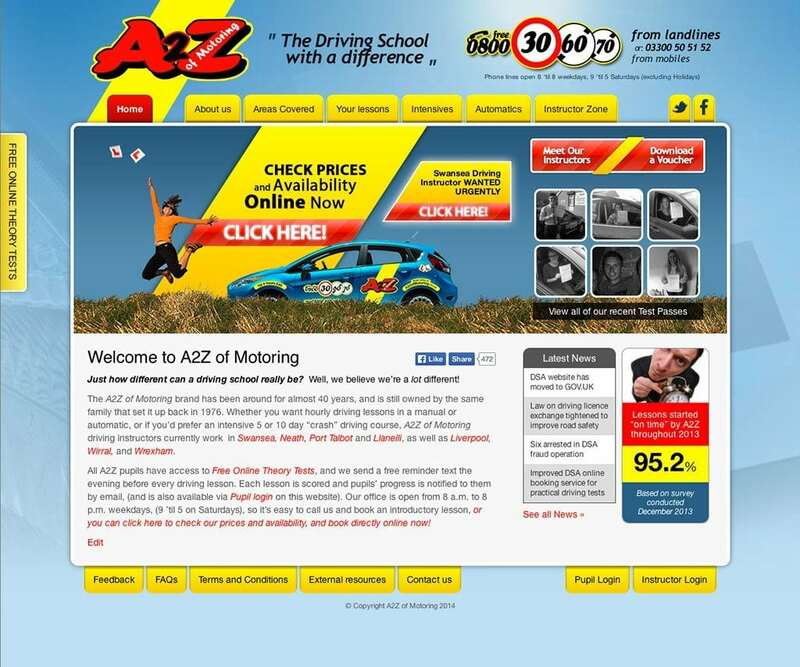 In addition, A2Z of Motoring needed to achieve higher impact in their local areas for driving lessons and driving instructors, as well as having a fully content manageable website and initial search engine optimisation. A2Z of Motoring needed advice on the best content management system to use for their business and one that could best fit into their current online development workflows. They also wanted to ensure the lifespan of their online presence going forward in a cost effective manner and with minimal resources. For the redesign and redevelopment, A2Z of Motoring needed content manageable sections on the website devoted to News, FAQs, Feedback and their latest driving test passes. A2Z of Motoring also needed to integrate some of the software provided by Driving Instructor Services onto their website in the form of information feeds, pricing and instructor availability options. The SeedMill worked closely with A2Z of Motoring, providing them with a strong feature set of content management capabilities. Built using WordPress as the CMS of choice, the A2Z of Motoring website is extremely powerful and effective as a business solution. It offers content manageable SEO content and imagery throughout the website. The solution provided allows A2Z of Motoring to promote their business with very little cost and keep a strong SEO presence in the Swansea area as well as other regions that they serve. The SeedMill analysed the industry sector that A2Z of Motoring were in and provided high quality consultancy on how they can better compete and achieve impact online. The SeedMill also developed and consulted on various tools implemented within the A2Z of Motoring website.